What is up with the Delta.com Upgrade list vs. the Delta phone APP? I have been seeing this more and more as of late, that when I use my phone APP it shows me much higher on the upgrade list than Delta.com. That is, when I can get it going since it takes so long to start up as I blogged about and uploaded a video to YouTube of just how much time it takes HERE. 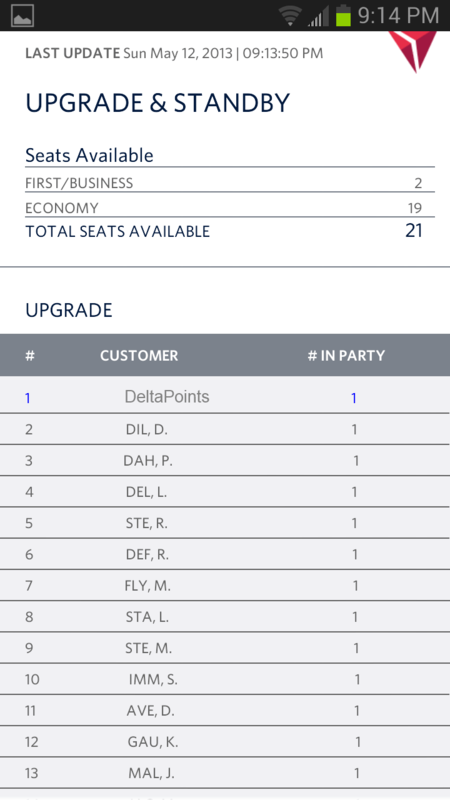 When I do check at the gate, the upgrade list with my phone app does match the gate display compared to when I log on to Delta.com with my laptop and compare the same list. Have you all been seeing the same thing on the I-Phone app vs. Delta.com or any other strange goings on at Delta.com? Let us know please. 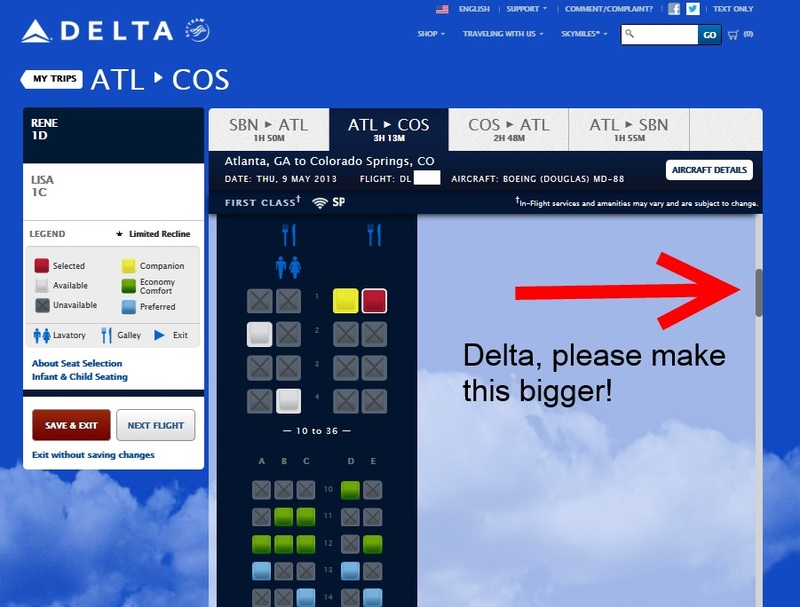 Or maybe it is just something you don’t like about the updated Delta.com. 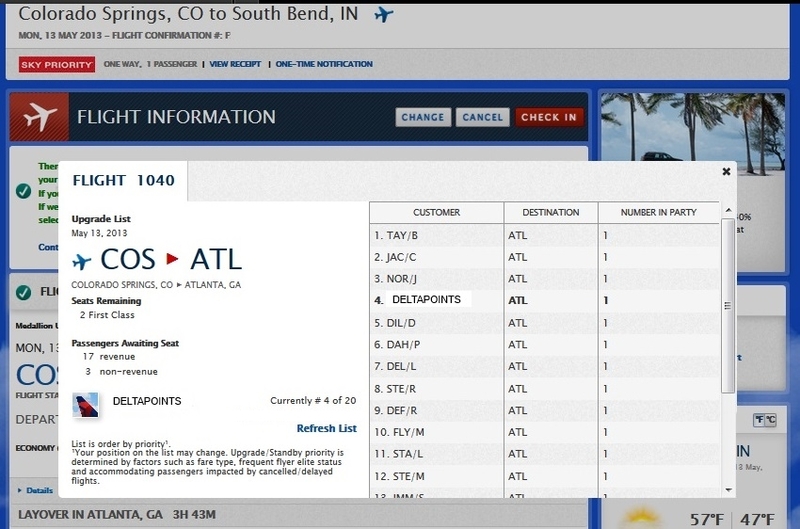 For example, another thing that I wish they would change is the uber-tiny scroll bar on Delta.com (does it make you crazy too?)! 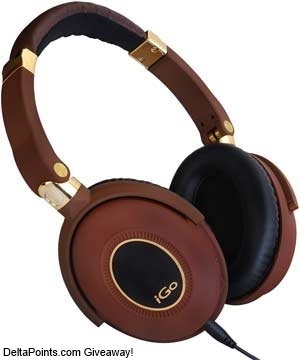 @Chris – txs for feedback! Hi Rene, known glitches with DL IT. Seems that the website — and for awhile the app, too — often includes standbys on the list as well as Medallion upgrades. Best to trust the app right now or better yet, the gate display if available. Since I’m just FO, I may see a more drastic difference. On my last flight (ATL-DTW), I was 7th on the iPhone app and 29th on the web site. Wasn’t expecting to clear either way, but it’d be nice to know where I really stand. In this case the gate display matched the web site, and NOT the iPhone app. Hey, you’re lucky you can even view the upgrade list. Often the link to view the upgrade list never appears on the iPhone app. It IS there sometimes, just not most of the time. And often when I try to view the upgrade list on the website I’m told either it can’t be displayed right now or told I need to be checked in order to view it. Of course, I am checked in, but try arguing with a broken website. My upgrade on the JAN/ATL cleared after u had boarded and the ATL LGA leg cleared while I was flying the first leg. My return flights on Monday have not yet upgraded and the LGA ATL leg shows 10 open seats in first. The experience is exactly the same with the I phone AP.. I have been told that the website up grade list includes all passengers who had not been assigned a seat even if they are not waiting for first class. Why the web site cannot match the phone ap is beyond me, but the upgrade list on the web site is all but worthless! As a DM, I’ve flown 72 segments this year. Good news is 69 have been upgraded. Yesterday second leg was 4th DM on the list NOT to get the upgrade out of ATL. Not complaining since most upgrades occur 5 days out via email. The biggest problem I have with Delta app is when flight is delayed and it takes me to complete my flight segments b4 it updates. Too much delay on the app when searching other flights to update connections, it never works. I read your blog everyday and yes have the RESERVE card just in case of the tie breaker! Fly safe! The upgrade list shows seats available and not first or biz available of late, odd and not clear on top of app not matching up. As a Diamond I don’t get upgraded ahead all the time and many, especially through a major connection or ATL it’s a last second deal if at all. Appreciate the upgrades though not a sure thing. Most of the time I am unable to access the upgrade list on the website. In any event, it does not really matter. As a lowly Gold, I am usually so far down the list there is no way to get an upgrade. On FO bag tags. 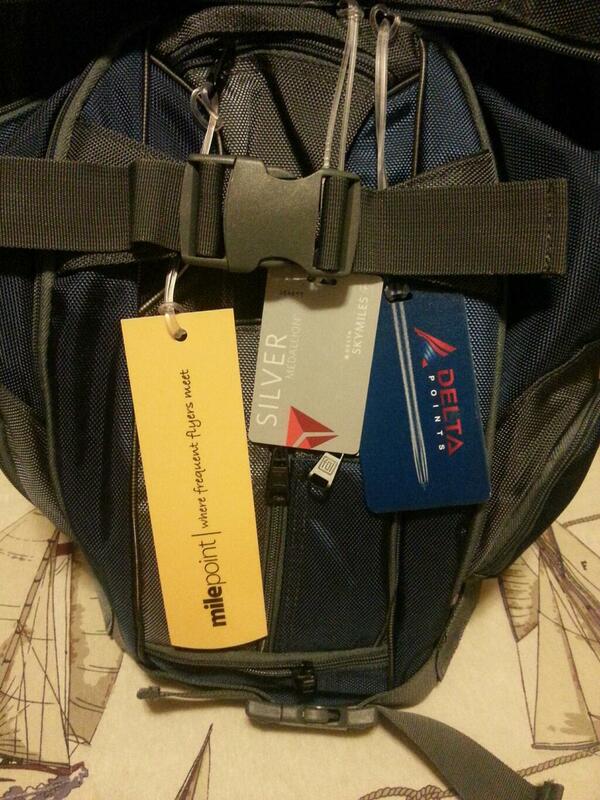 My Diamond tags were stolen off checked bags DTW-DEN in January after making NRT-DTW! Both straps to which the tags were attached were intact, but tags and metal attachments gone?! I guess they are really just “brag tags”! I thought these tags would help keep my luggage from getting messed with, but I guess it was the opposite. Now stuck with my old PLT tags, still feels like “bragging”. I am having the same problem. I was showing 5th on list (as a diamond) on my computer and first on the phone app. The phone app matched the gate LCD and I was cleared. It did leave me wondering….. I was surprised I was upped on a bargain fare Accruing nice miles! 1. Flexible date searches for Asian destinations like BKK, HKG always produce a matrix of results where about half or more are “not available.” This is really annoying, and was supposed to be fixed with the new website. Not! 2. Depending on which browser I use (Firefox or IE) results for award tickets differ. 3. Sometimes flights like international economy are displayed as upgrade eligible when they are not. My wife and I argue about this all the time. She prefers the old Delta App with the link to the full site which gives bogus upgrade position. I prefer the new Delta App which I’ve found to be the same as the gate. I also hate how the app wont generate new boarding passes if you change seats. But it all beats US Airways where no one sees the list! IME, the Android app upgrade list always agrees with the GIDS (both for available seats and ASL position).